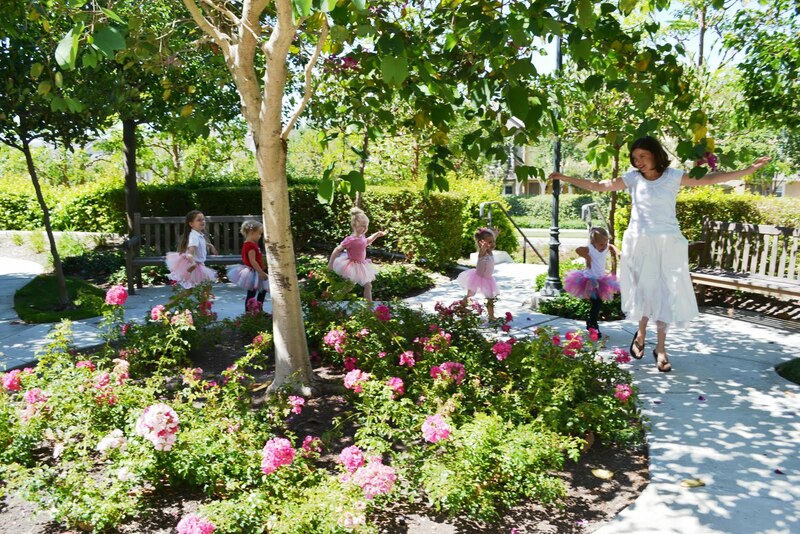 Polkadots on Parade: Go Mama Monday: Ballerina Birthday Bash!! My daughter turned 3, and I decided it was time for a totally girly, outrageously cute, fabulous fun PARTY!!! She loves to dance so we had a Ballerina Birthday Bash! I'd been wanting to make this totally fantastic balloon wreath from How Does She forever, and this was the perfect occasion! I added a little pennant bunting for fun! I made rainbow tutus for all the little ballerinas. That fabulous tiered plate was made from plates and sundae glasses from the dollar store!! Such a steal, and so easy!! 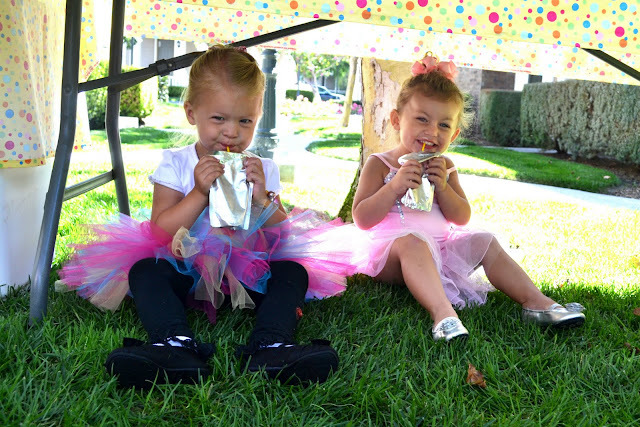 Capri-suns are always tastier under the table. 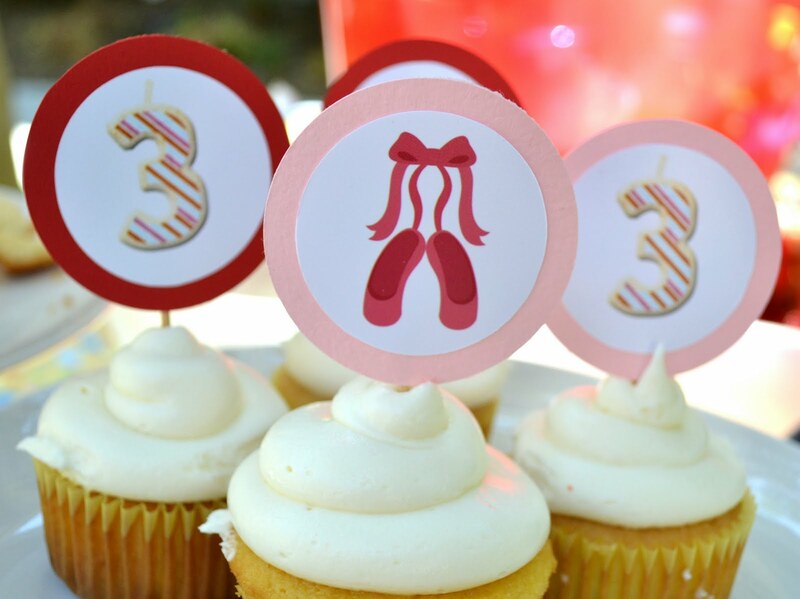 Ballerina Birthday Banner with graphics from Print Candee! Tissue Pom-poms were hanging from the trees! 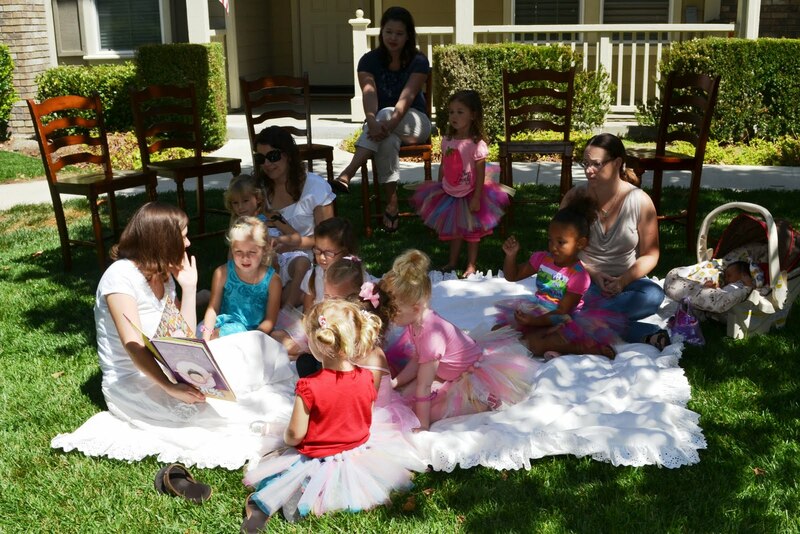 We settled down on the blanket for a ballerina book. ...and skipped around the roses! 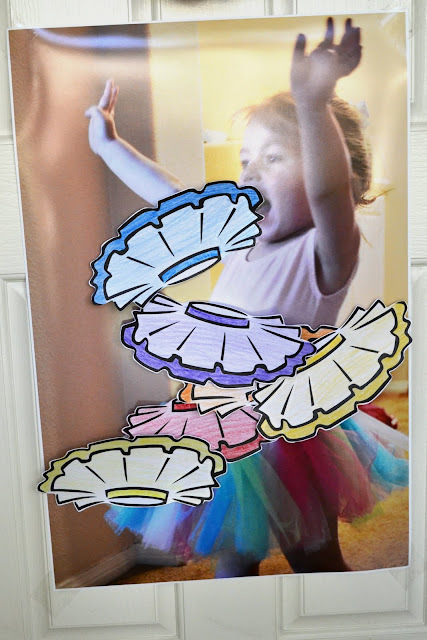 We played pin the tutu on Kelsey! And sang to our favorite birthday ballerina!! It's all about the frosting. Birthday balloon favors for all the little ballerinas! And tied to the bottom, bracelets and a wand wrapped in chiffon! 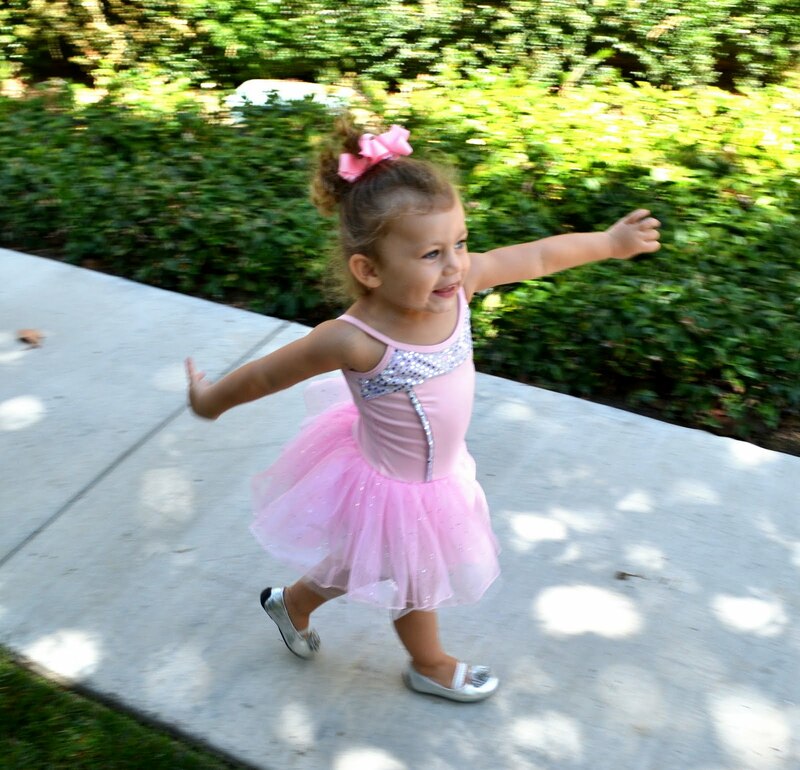 She had a ball at her ballerina birthday bash!! And I had a ball creating it for her! What a cute party and birthday girl! You did a great job!! This is adorable! 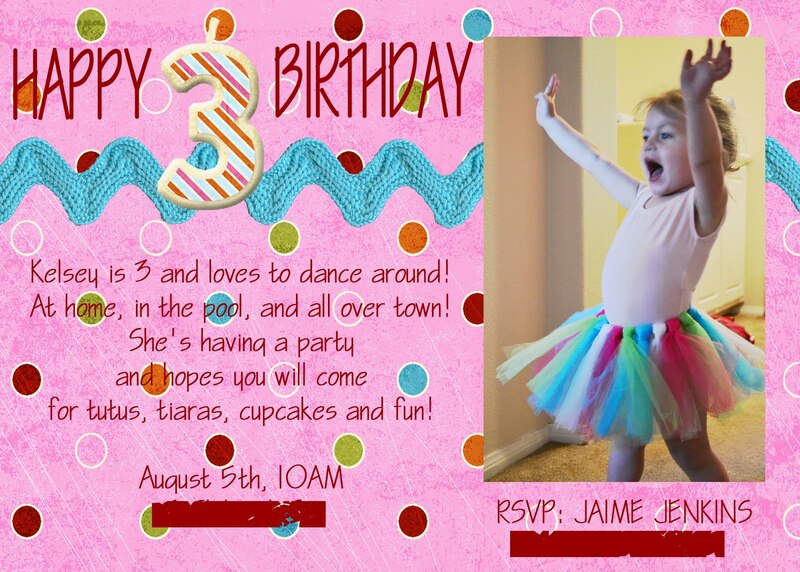 I love doing Birthday's they are so fun putting them together :o) Looks like you guys had a blast! What a precious Birthday Girl! Very fun! We had a ballerina birthday party for my oldest when she turned 3 (http://btanders.blogspot.com/2010/01/ballerina-birthday.html). I think all girls love to dance and twirl. Happy Birthday to your little one! What a cute party! My daughter is just getting into dancing, so this may be our party theme next year! Thanks for sharing! Also, new follower- love the blog! Hope you'll stop by and do the same! I love it! I think my favorite part was the little tutus on hangers. That is so stinkin' cute Jaime!!! How fun! so cute!! 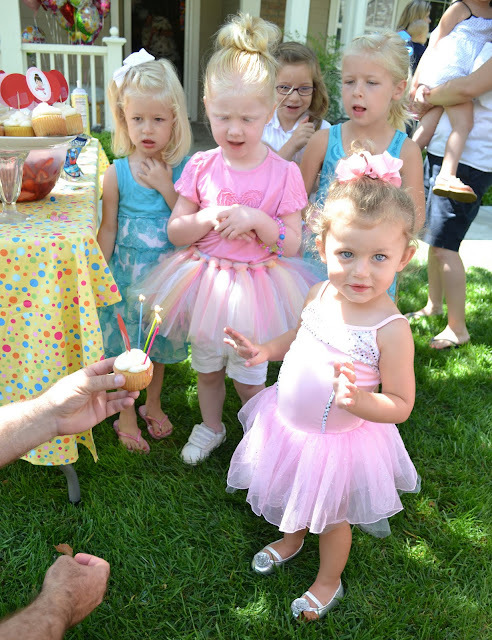 Such a sweet party & adorable little girl!! Love the wreath & the tutus & well....everything! Looks like all party goers had a ball. Following your blog now.I would love for you to show this off at my Wickedly Crafty Saturdays! The link is still open. so fun!!! love the wreath - that is a must make! Very cute party! Loved the wreath, the tutu's, the poms, and everything. Nicely done! OH! I would have likes to be invited even if I'm almost 30 ! Absolutely gorgeous, that balloon wreath is so creative. Well done you! everything looked beautiful - bet she had a ball! Great party. I love the wreath, especially the bunting through the middle! I'm a new follower too!! I love the wreath! I did one similar to that not too long ago! The party looked so fun! I'm hosting a link party today. Stop by if you'd like! Your wreath is totally fabulous and your party pictures are adorable! Hi. 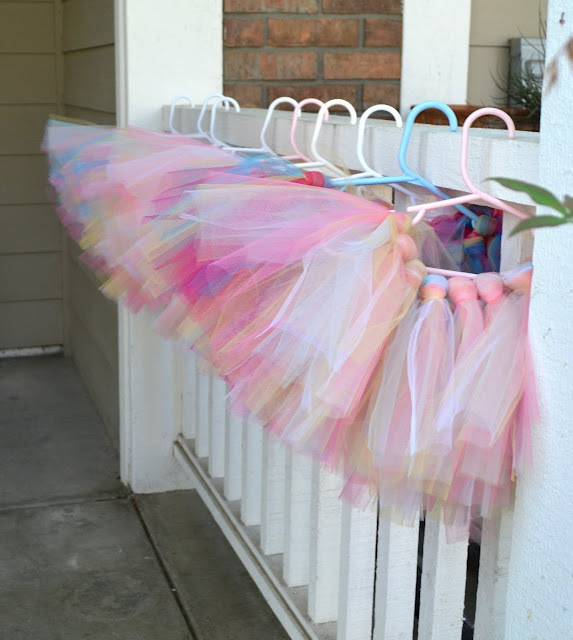 love the idea, Could u please tell me how to make the tutu? Thanks for linking this up to my Wickedly Crafty Saturdays! Get ready to show me some more wickedly awesome stuff! Looks like a very fun party! What a cute party! It is all awesome but I am especially IN LOVE with the wreath! I know I commented on this earlier in the week, but I just wanted to let you know that I've featured you today on Sew Woodsy. Hope to see you tomorrow at another edition of What's Up Wednesdays! Such a wonderful and fun party! We are having our first link party today! *Crafty Lassie Tuesday* We would it if you came over and joined us! Featured tonight! Love the attention to detail ~ thanks for making Dragonfly Designs one of your link ups!! 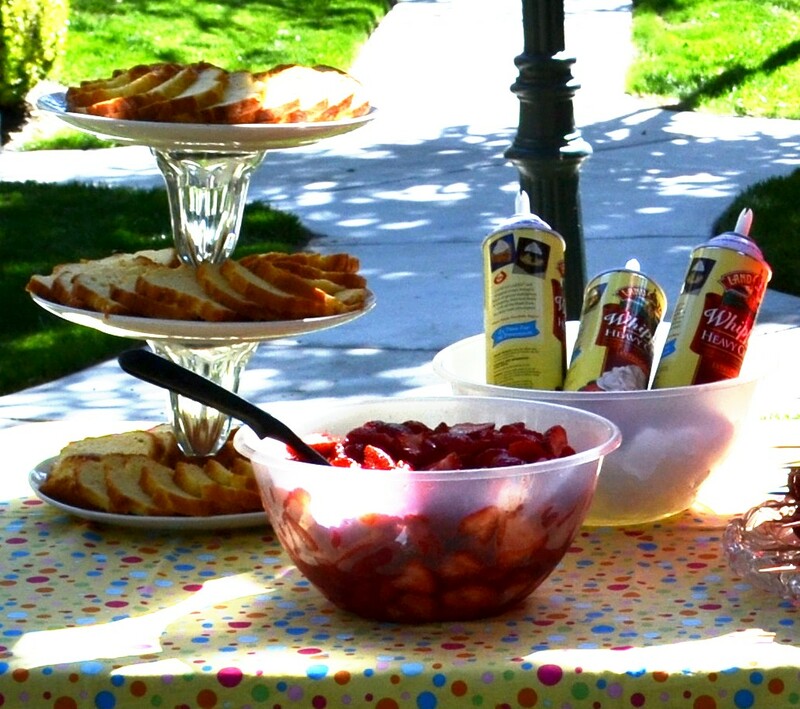 What a cute party for your little one! Love the decor! This party is amazing! Everything looks wonderful and perfect! Thanks so much for linking it up with us! Awwww this is absolutely adorable! 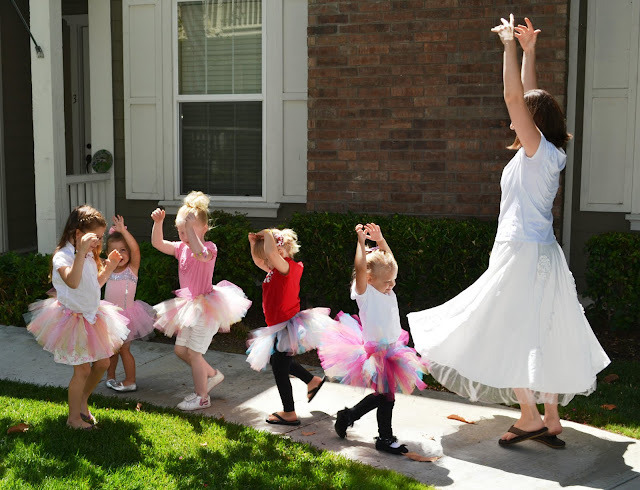 Please, please do a tutorial on how to make those adorable tutus!! 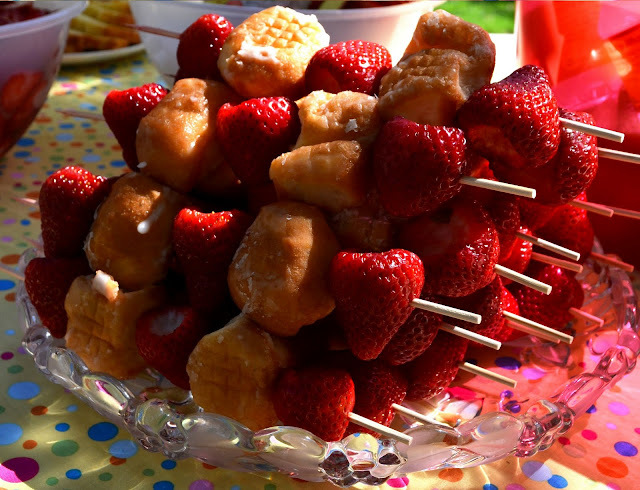 :) Such a cute party! Love the idea for the balloons as a favor. Great party!! believe it or not- I found you through a alice-in-wonderland kind of rabbit hole through pinterest because of those tutu's and I am going to borrow the idea for our upcoming party- what a great idea! thank you so much for sharing it. Go Mama Monday: The Cutest Bib Giveaway!! Toast of Tuesday: Home Decor Edition!! Go Mama Monday - Zucchini Bread!